You know this thing about Legend Quest Games? Legend Quest Games is one of the newest categories offered by our team for you, all the players who visit us every day for new and exciting games. In the Legend Quest Games category you have a lot of challenges for boys and girls. In Legend Quest Games you can find 1 games that we've published for these kids and childrens that are interested to play Legend Quest Games, this game gategory have been created on 23.06.2017. These games with Legend Quest Games have been voted 1 times and the avarage of vote is 5.00 stars. We advice you to play the last flash game from Legend Quest Games, Legend Quest Jigsaw that have been published on 24.06.2017 06:00. Legend Quest Jigsaw its a part of Legend Quest Games category and until now its played 520 times. Try it now on Cute-Games.com! If your like the Legend Quest Jigsaw game you can write a comment in the game page. Recommend this game to your friends if you like it! Find More About Legend Quest Games! 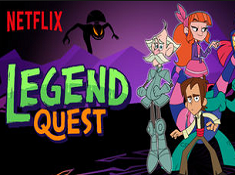 Legend Quest Games is an exciting category where you will meet new characters from an interesting Netflix animated television series which has appeared this year. If you know the series I am sure you will be glad to find out that now there are also games with your heroes from cartoons only here on our site, the best games site in the country. If you do not know about the show let me tell you a few things about it. The main character from the show is a boy called Leo. His home town from Mexico is attacked by some strange creatures and he has to fight with them with his friends: Teodora, Don Andres and Alebrije. They find some allies all over the world and they have to work together to find a way to destroy the creatures which want to eradicate the man kind. I am sure you will enjoy the presence of the heroes in this game and you will do your best to support them in their mission. Let me tell you more about the characters to learn about their personality and skills. Leo is the leader of the group and he has the ability to see and speak with ghosts. There is a prophecy about Leo which says that he is the one wo will kill the Serpant. He is a brave boy and he has to find a way to defeat the evil forces. He can do it only with the help of his friends. He used to live with his grandmother in Mexico and the old lady thought him all she knows about interaction with the ghosts. Teodora is a girl ghost who is going to help Leo in his quest. She has modern cell phone and other things and this can make us believe that she comes from the future. Later we will find out that she is only in a coma, she is not dead. She learned to control Astral projection and now she has some abilities that other ghosts do not, such as interacting with physical objects or resisting to the attacks of the Medusa. She came back in time to help Leo. Don Andres is also a ghost but sometimes he is scared for his safety although he can not be harmed anymore. He claims that he was a barber and he knows a lot of things about anything. I am sure you will love these interesting and unique characters from the show and you will enjoy the games that have them in foreground. In the Legend Quest Games category you will get a lot of challenges, for all the kids, boys and girls. You have to work a lot in this category to make sure that you will complete your goal successfully every time, that you will get a big score. You need to be fast if you want a lot of points, if you want the chance to reach the podium where are only the best of the best. Let us know what do you think about Legend Quest Games category which is going to be here in exclusivity for you. We like to surprise you every week with some new categories inspired from movies, series or animated television series. Give us a g plus to help us promote this category for all the kids who love the new Netflix animated television series. I am going to bring you some news here on our site in the Legend Quest Games category so stay tuned every day. Try all the games and I think you can find something you like with Legend Quest. The first game from Legend Quest Games category is a puzzle game. You have three puzzles that you can solve in the game and you can chose them from the top. You can also select the number of the pieces. Try a small number if you are not too good with puzzles. I am sure you will become better with a little training. If you solve the puzzle fast with a small number of pieces I suggest you to add more pieces in order to make the puzzle more difficult. In this way you can become better at puzzles. This is a sliding puzzle game that I am sure is going to be on your taste. You can also add numbers on the pieces because in this way you will find out faster their place in the puzzle. You can see the heroes from Legend Quest in the puzzle: Leo, Teodora, Don Andres and so on. tell us which was your favorite game from this category and of course if you want more challenges with your heroes from Netflix and our team will bring them to you.